If you don’t want or can’t afford a brand spanking new, five bedroom home that occupies 4,000 sq. ft., don’t despair! 😉 There’s still a chance for you to live the American dream! 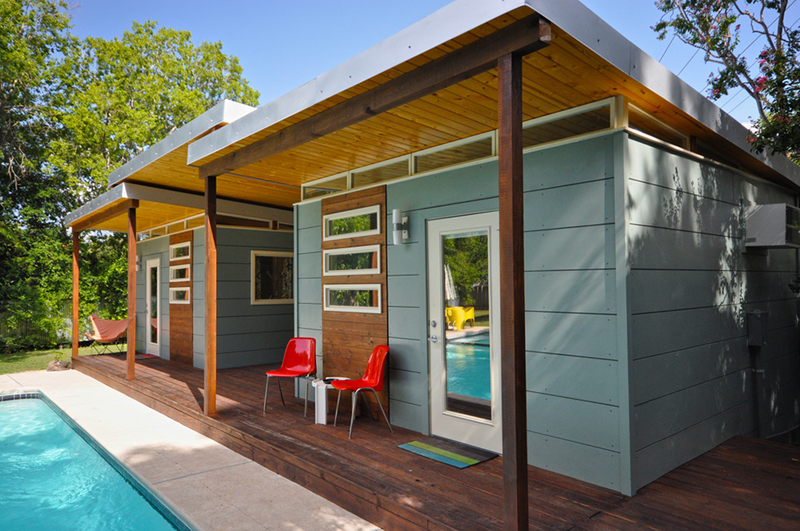 Let us present the top 20 professionally designed tiny houses. It’s true that a family of four will probably have some problems living in such a small space, but they are perfect living spaces for millennials, young couples, singles and even a family of three. It all depends on how much space you are used to living in and what your lifestyle goals, aspirations, preferences, and desires are. Before we get started, let’s briefly mention the importance of getting a building permit and or a site plan before you plant that tiny house or even a spaceship-like livable capsule or an eco-pad! 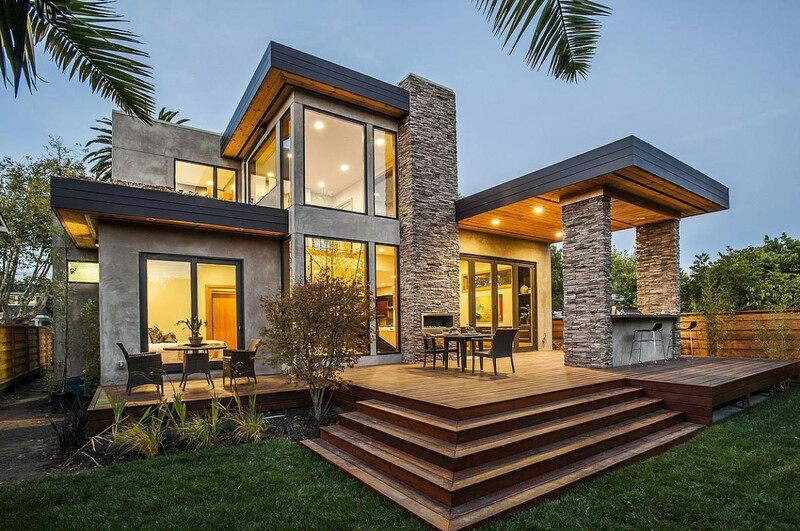 Although it may be small or tiny compared to building a traditional house, any construction or placement of a habitable structure will most likely require a permit. The regulations are not the same country wide and not even state wide. Some areas have specific requirements that you must comply with. For example, regulations in high tornado risk areas differ from parts of the country that virtually never get hit by tornadoes. 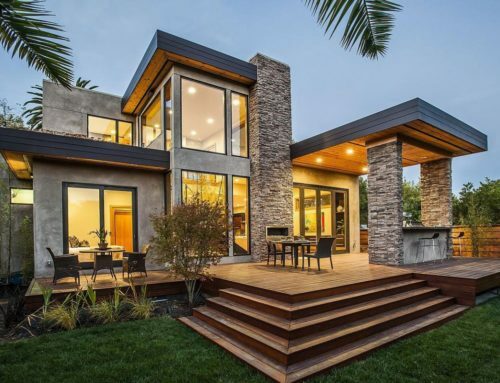 For the most part all the local building code requirements are meant for the safety and well-being of the local community and current and/or future building occupants. Building codes are not necessarily trying to slow down the building process or to make money for the local budget. They are intended to keep you and your family as safe as possible in the face of natural disasters or other unforeseen circumstances. In order to apply for a building permit, you will most likely need a site plan. This is merely a drawing of the place where you want to build the house. Applying for a permit is not cheap, so it’s understandable if you want to save some money in the process. The best way to do this is by contacting the guys at https://www.24hplans.com for inexplicably affordable, quality site plans. Not only will you get a professionally drafted plot plans, but you will also get them in the shortest amount of time possible. Use our promotion code: 24hplans-20off to get a 20% discount off any package. — Please note this is a limited time offer, exclusive to the readers of our blog. This offer is not being advertised anywhere else. This house belongs to a lovely couple and measures less than 200 square feet. If you are looking for maximize space, this is the design you should look at. The bed is above ground leaving enough space for a small kitchen underneath. Note the farmhouse like aspect that suggests this couple from Portland wanted to live their dream without spending a fortune. The plan should not cost you more than a couple hundred dollars and the construction itself would take about $30,000 assuming you want to build a foundation for the house. This 240 sq. 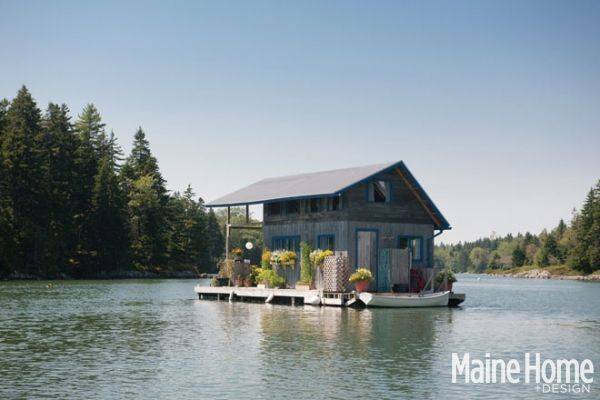 ft. floating cabin in Maine belongs to Foy and Louisa Brown who spent a decade building it with their own hands. The foundation is made of pontoons on top of which you see a cottage built mostly of pine shiplap. This house is totally off the grid, so if you enjoy the perks of modern life, you will hate living here. The best part is that there are not property taxes and no permits required to build such a house, according to Foy. 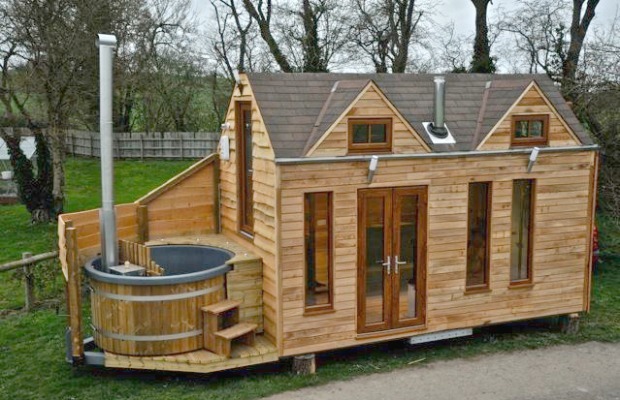 The house is literally floating and it has a water tank to supply the shower and kitchen. There are 2 propane tanks to power a refrigerator and stove and to give you hot water. The plan for this house might cost you more than $300-$400 because it’s unusual. The actual construction is cheap and doesn’t go beyond $35,000. 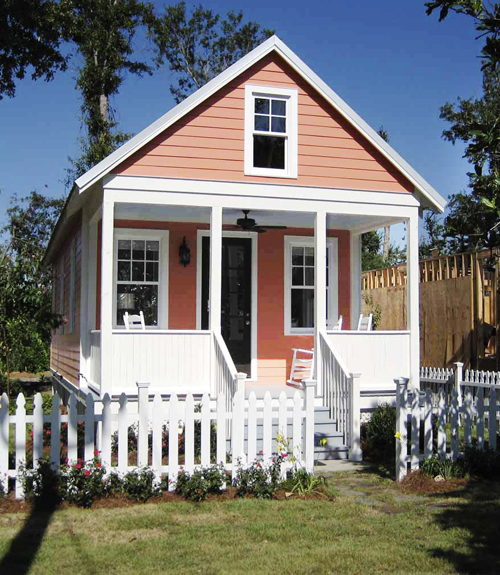 Here’s a beautiful traditional small house with gable roof. 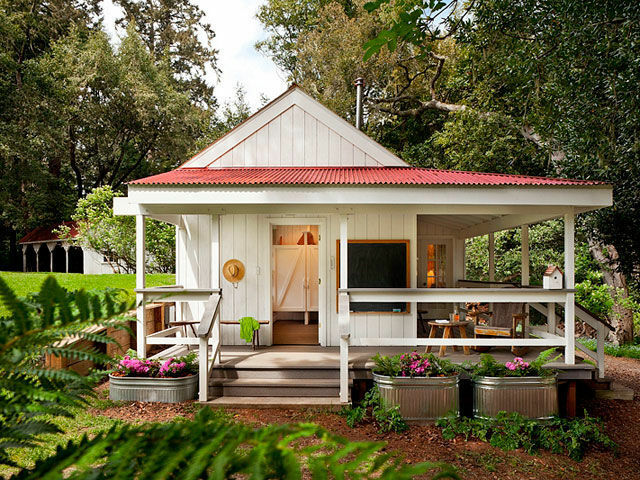 Located on a dairy farm in Northern California, this house has a wraparound porch for you to stay on during silent summer nights. It’s family friendly through how it looks on the outside but also the inside. The red and white hues make the house look young and joyful. Expect to pay around $700 for the plan and around $40,000 for its construction. 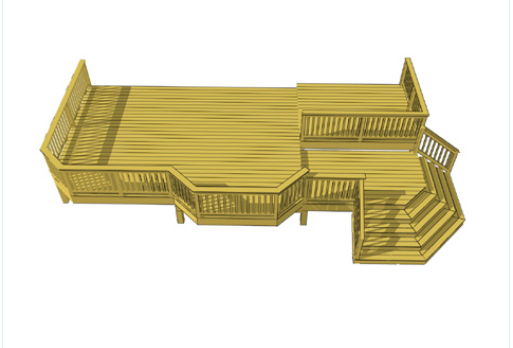 The costs vary depending on the type of wood you use want to use for the deck, walls and roof. 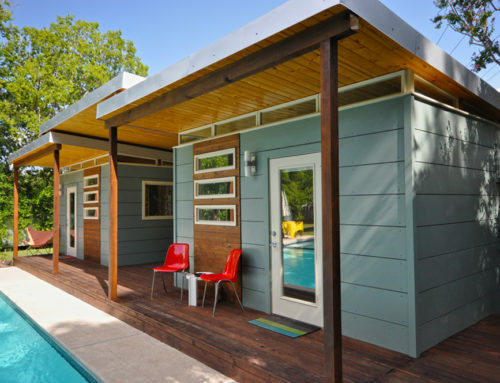 Here’s a special tiny house design. 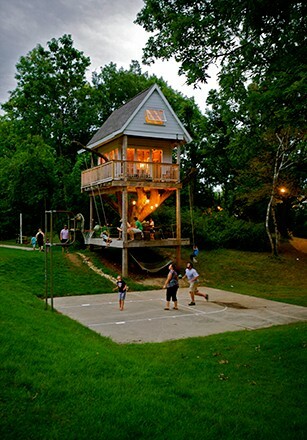 The construction is actually a treehouse, the dream of any 8-year old. However, adults will be pleased too when they see how it looks inside. The furniture is mostly made of hardwood. No Ikea for this design if you want it to look rustic. The interior stairs lead to the upper level to find a bookcase and a comfy armchair where you can spend you days reading and nights chilling with your loved one. Depending on the complexity of the project, you can pay as little as $10,000 or as much as $50,000. This design combines wood and metal. 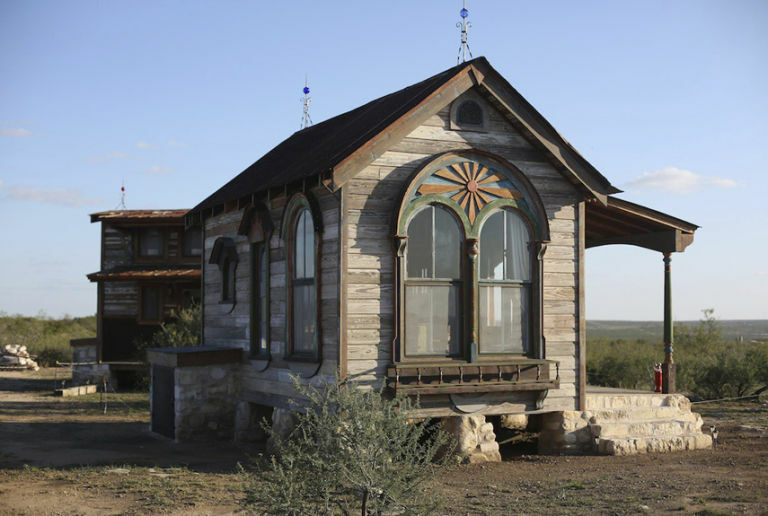 By using reclaimed materials, the builders transformed scrap metal into a cool and fully functional house. Apart from this, the costs are reduced because brand new materials are more expensive. It’s obvious that the design works best for mountain areas close to hiking trails or nature in general. Building it in the city makes it look out of place. The small porch is optional but it certainly makes the house more beautiful and also allows you to enjoy your coffee outside during summers in the mountain. If you choose to limit the floor to 200 sq. ft., you can build this house for less than $30,000. Here’s another house meant to be in the middle of nature. Bricks were used this time instead of wood, making the house more suitable for very windy areas. The house is insulated and has energy efficient windows that doesn’t let the heat escape. The metal roof protecting the house is durable and its shape allows the water to easily run down, making it perfect for rainy locations. The house lacks a porch, but there is a patio where you can sit back and relax in a comfortable chair. It’s true you won’t be protected against rain or snow, but then again who stays outside in bad weather? A 400 sq. ft. house with 1 bedroom takes $400 to plan and about $60,000 to build. This design is very straightforward and has a very suggestive name: the matchbox. It’s fully off-grid and self sustaining. It’s also very small: only 140 sq. ft. Earthen plaster clay controls humidity and solar panels supply electricity. 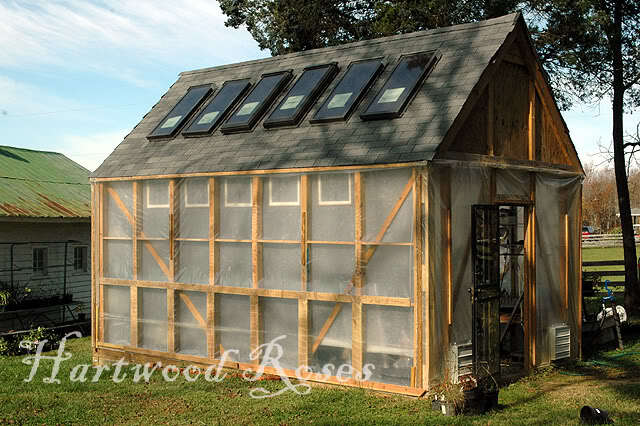 The house has a composting toilet, a rain catchment system and of course a fledgling garden. 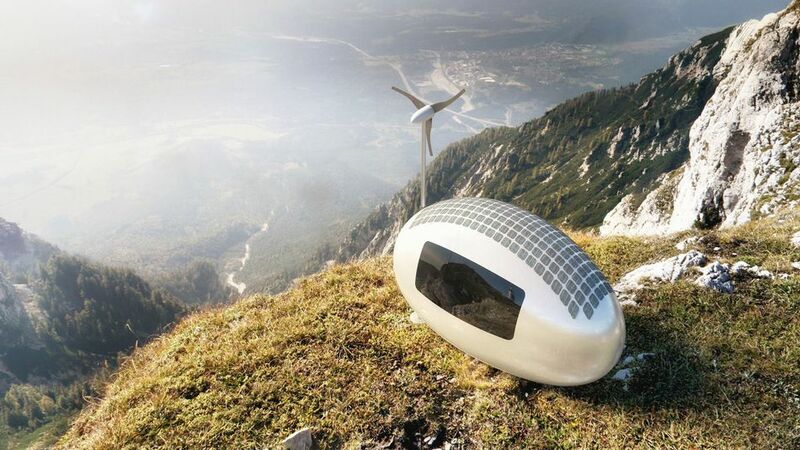 You can actually put the house on wheels and move freely to other cities. The design is cheap because it’s basically just a box. 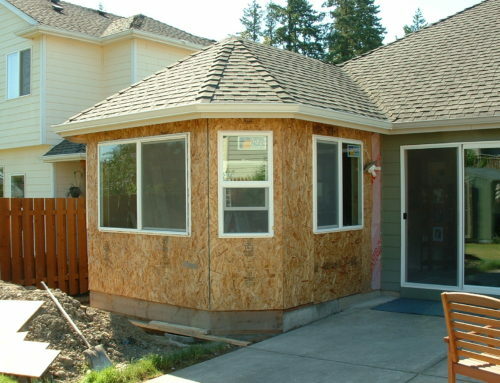 The construction itself should not cost more than a wooden shed considering it actually can be used as one. Given its dimensions, you won’t need a high amount of wood. The biggest investment will revolve around making the matchbox livable. The outside of the house looks rustic and somehow gives you a heads up about what you will find inside. Measuring about 12’ x 21’, this house is made of salvaged materials. There is enough space for a small kitchen and living room. If you go upstairs you will find the bedroom which actually looks nice. 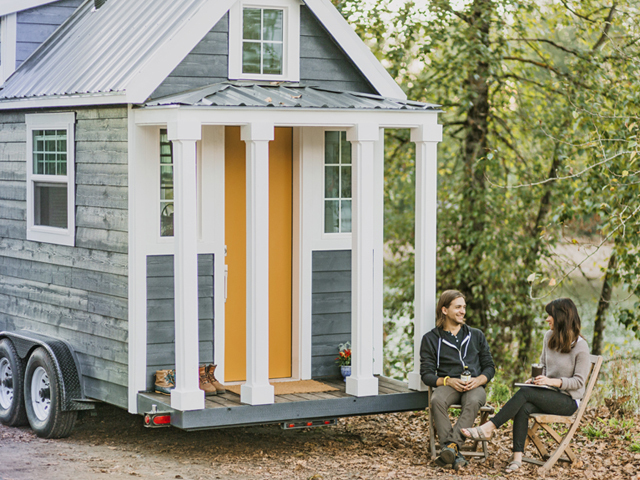 If you are the type who has lots of furniture, you should probably steer clear from tiny homes. The bedroom is big enough for a double bed and a small wardrobe to keep your clothes. Anything more than that will make the room look cluttered. 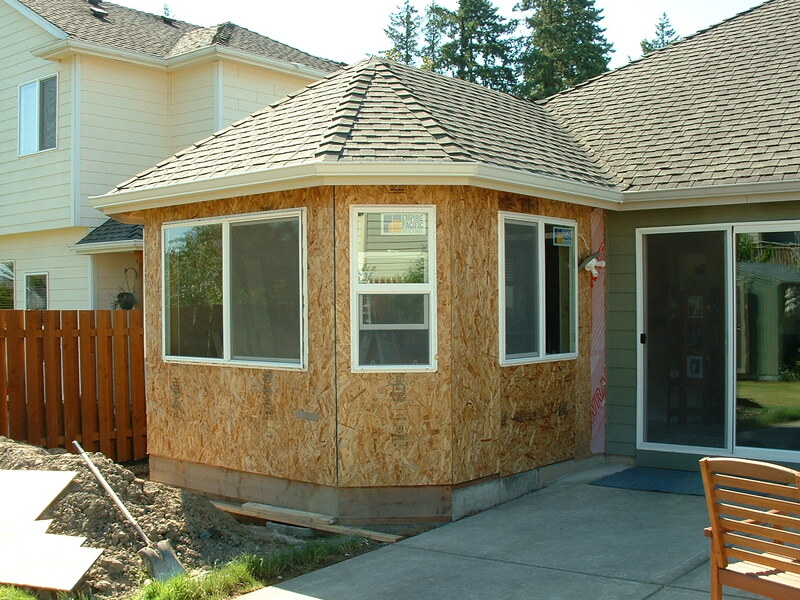 The construction costs can easily be kept under $20,000 if you use more than 90% salvaged materials. Some parts of this house are even 200 years old and they keep on serving their purpose for a new house. This is a typical American house made of painted wood. The porch is perhaps the most American element of this design and so is the wooden white fence. The house is not as small as it looks: 544 sq. ft. Inside, you will see 2 bedrooms making it perfect for a family of 3. If you are the type who enjoys living in small towns, this house should definitely be on your list unless you plan on building a luxurious 4000 sq. ft. property. You will have to pay some $800-$900 for the plan and about $70,000 to build it considering the costs of the materials, land, foundation and permit. This design makes use of vertical space and can be fitted between 2 distanced regular houses. For that reason, you will mostly see such tall homes in crowded cities where land is expensive. So, saving money on land costs is another reason why you should consider similar projects. If space is a problem for you, here’s a trick: hang mirrors on the walls to make it look larger and install large windows to let more light get in. Install a shower instead of a tub and choose a very slim staircase instead of massive wood ones. Metal stairs give a modern look to the interior design and also save space. They are not recommended if you have small children though because they can easily slip and hurt themselves. In fact, this entire design is not child friendly. The plan starts at $800 and the average cost to build per sq. ft. is $150. 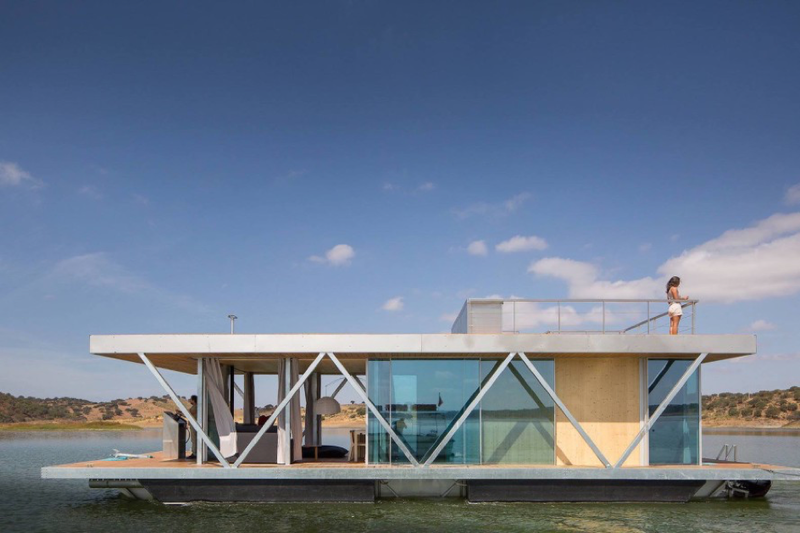 Located in Portugal, this floating house is solar powered and self-sustainable. People who focus mainly on energy efficiency and eco-friendly materials will find this design very satisfactory, considering it can take care of its own energy needs all year long. 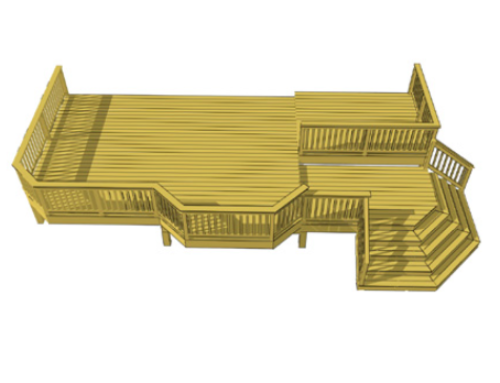 The upper deck is the most interesting part of this design. You can add some patio furniture and a couple of chaise longues to get a tan during hot summer afternoons. 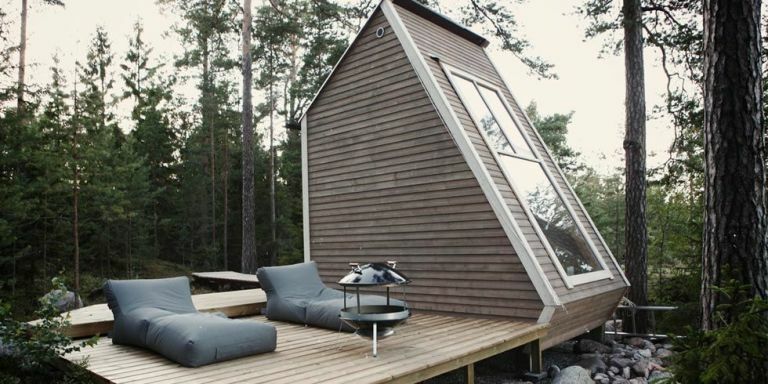 This house can go on its own for 6 months without needing refuels or maintenance. The major part of the investments goes into making the house self sustainable. Measuring just a bit over 300 sq. 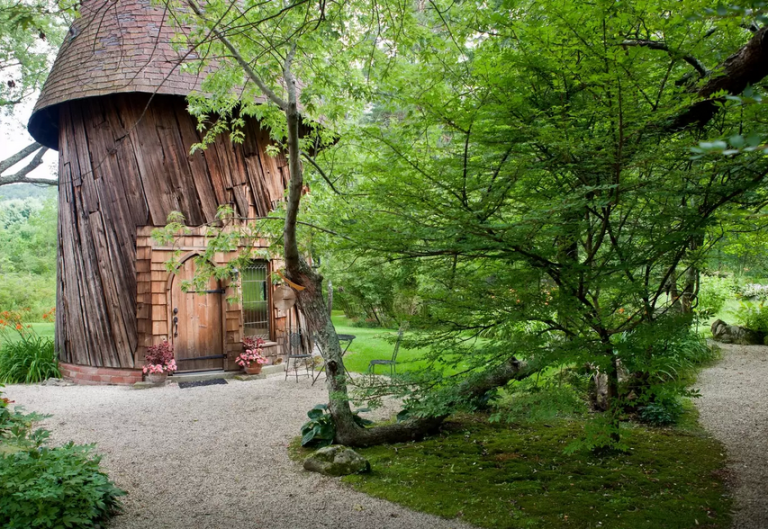 ft., this tiny house is made entirely of wood. It looks like its meant for dolls not people but in fact offers a comfortable lifestyle. 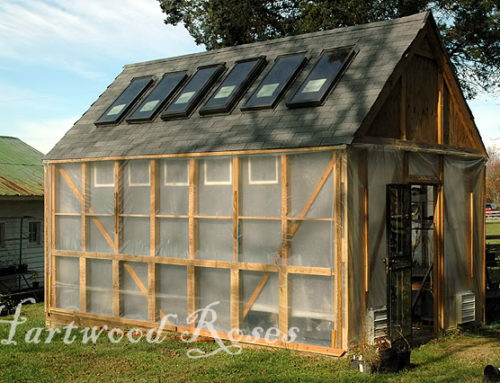 The price settles somewhere around $57,000 and it’s mainly available in England but you can build it anywhere if you have the skills, materials and tools. Upstairs, there is a room for the children with 2 separate single beds and a room with a double bed. The tiny tub definitely catches people’s eye, so you can rent the construction to tourists provided that you live in an area that attracts travelers. 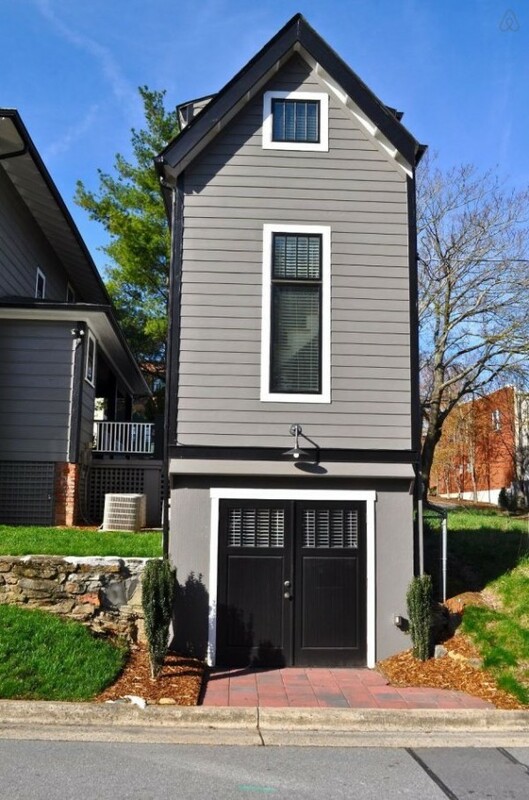 Although it doesn’t look like it, this house can actually accommodate 8 people in only 319 ft. Note that it has wheels so it can be used as an RV as well. The minimum cost-to-build is $73,000. The interior design is well thought making good use of space. It’s equipped with everything that a modern house has: washing machine, kitchen appliances, TVs etc. The windows make the interior bright and create the illusion of extra space. If you don’t like the color, you are free to paint it however you like. Make sure to get a car big enough to drag your house around on family trips. Otherwise, you miss on the advantage of having a house that literally rolls. 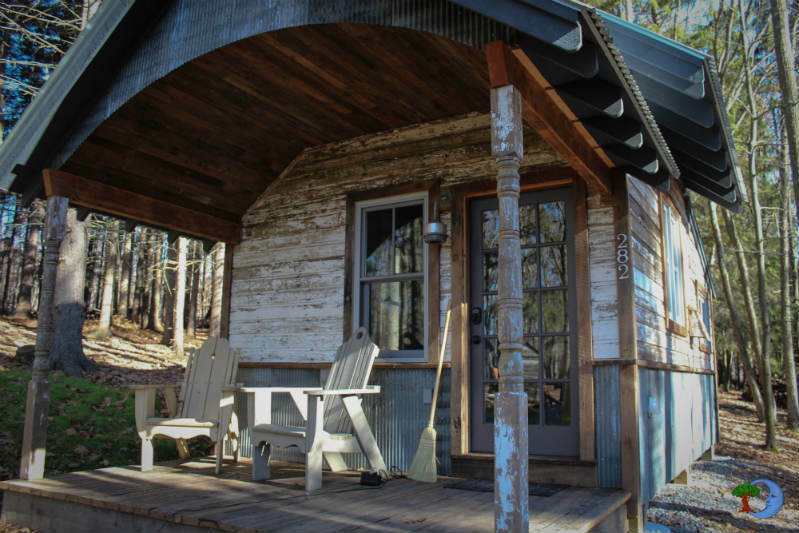 Located in the middle of nature, this cottage accommodates 2 people in 1 bedroom. It kind of makes you think of those monks who spend their entire lives in the heart of the mountains. Keep the costs under $25,000 by using salvaged materials. A house like this one shouldn’t be in the city. Its place is in the middle of nature where all you see around is trees, ponds and hills. Although most of us won’t get used to living all the time in this house, we can still enjoy a weekend in this oasis of tranquility. Whoever designed this house has a thing for old windows. Apart from giving the house a unique look, it also serves a practical purpose: it lightens up the interior. 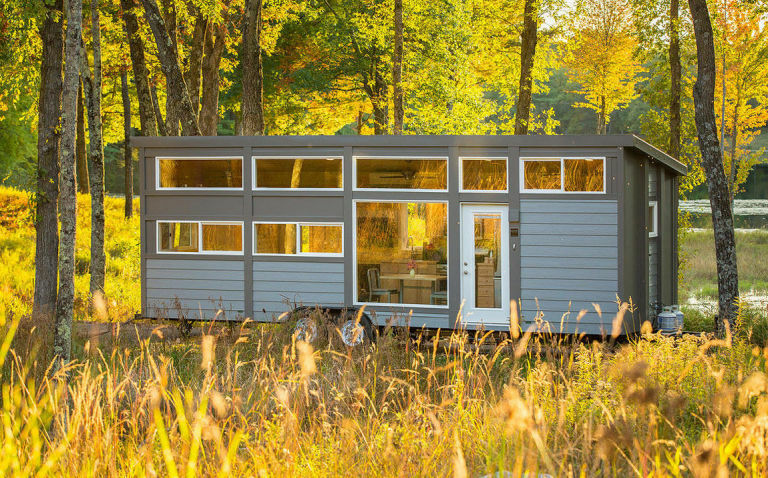 It took less than $10,000 to build this 140 sq. ft. living space. It’s true it has no electricity and no running water, but it’s perfect for anyone who wants to escape the busy city life for a few days. In some countries, you don’t even need a permit to build this house because it measures only 96 sq. ft. In Finland, for example, you only need a permit if the house is bigger than 96-128 sq. ft. 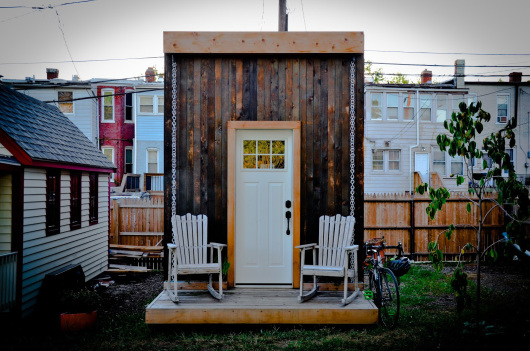 This micro living space can be made of recycled materials to keep the costs to a minimum. Given its dimensions and simplicity, it took only 2 weeks to build the house and a bit over $10,000 to finance this project. The bedroom covers 50 sq. ft. of the construction and it’s located upstairs. On the deck you can add a fire pit to keep you warm during chill nights watching the stars. 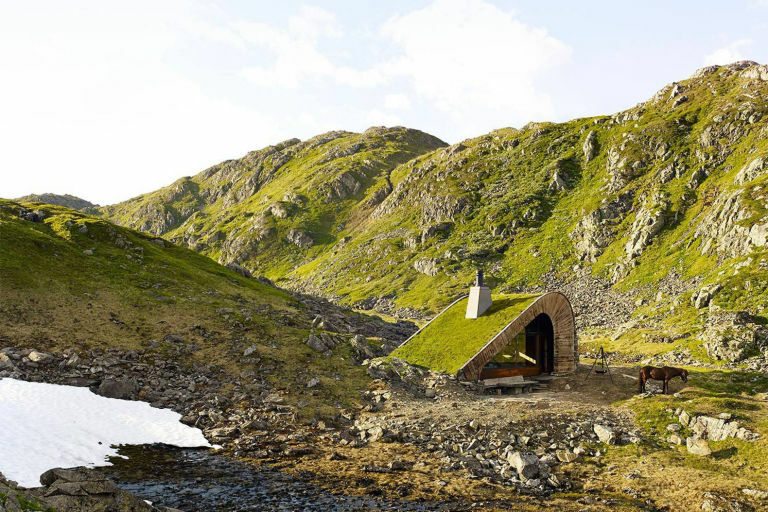 Anyone who’s looking for secluded houses should take a look at this one. It’s a 376 sq. ft. cabin that can be reached only by foot given its surroundings. The architects claim it fits 21 people and if you take a peek inside you will notice a very large space for laying down. Anyway, it’s still unlikely 21 people can fit in there but we welcome you to give it a try. The design is unique and custom made which is why the plan can cost more than $1000. The actual construction of the house however, should not take more than $60,000, the price for an average 400 sq. ft. house. Any additional costs come from bringing electricity and running water to the house. This may actually be impossible if you live in such a remote area. 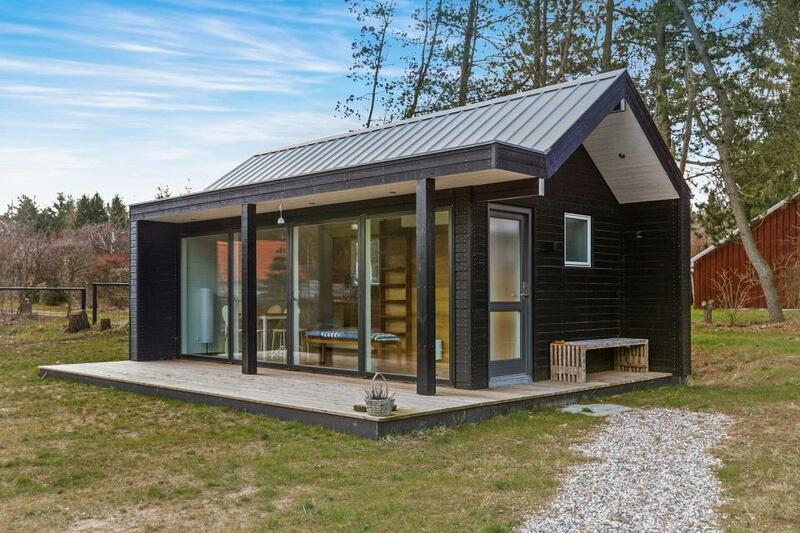 Made of black stained wood (traditional to Scandinavia), this house measures only 260 sq. ft. Upstairs, there is the bedroom that’s basically made of a bed and a small space to deposit your clothes. The price starts at $74,000. Once again you see large windows on the front of the house. It seems this is a popular way to draw attention away from how small the construction really is. 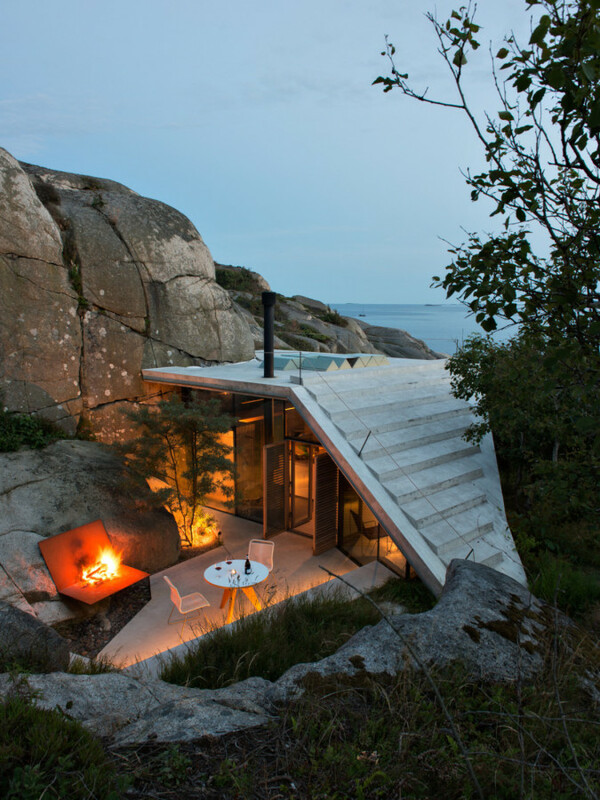 Built on a coastline in Norway, this cabin was designed to fit even the rockiest terrains. It’s well disguised in vegetation and measures 323 sq. ft. The bad part is that the construction lacks a kitchen in order to provide more accommodation space. the traditional American meal: burgers. 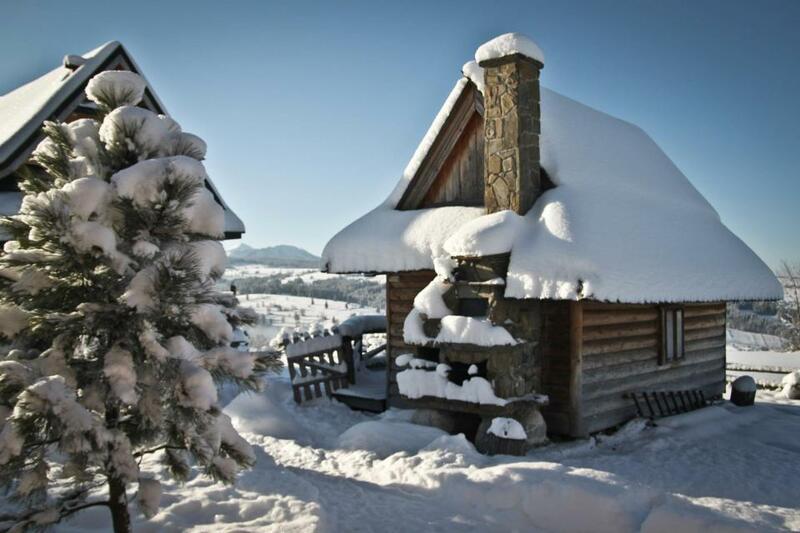 Here’s a cabin meant to be on the snowy mountain slopes. 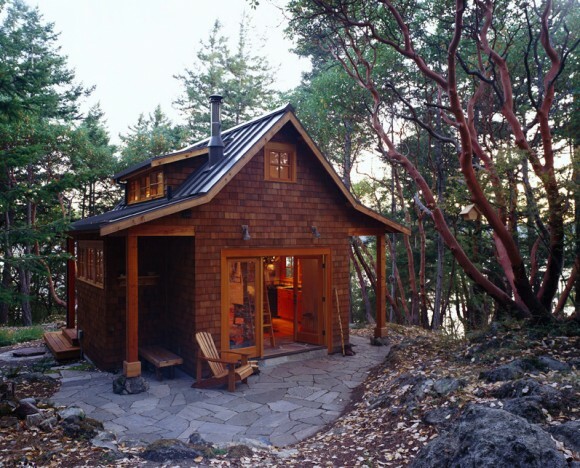 It’s made of logs and provides a small yet romantic retreat for couples. The interior design is modern combined with some extra rustic elements. There is no real kitchen because the cabin is small and you need space for a bed. There is electricity though and you can easily bring a mini fridge and a microwave. The bathroom looks amazing and has a stone heated floor. Just imagine the warm feeling you get when you step on it in the middle of winter. Pure bliss! Some brilliant designs here. I particularly like the floating Portuguese house – what a great holiday pad! 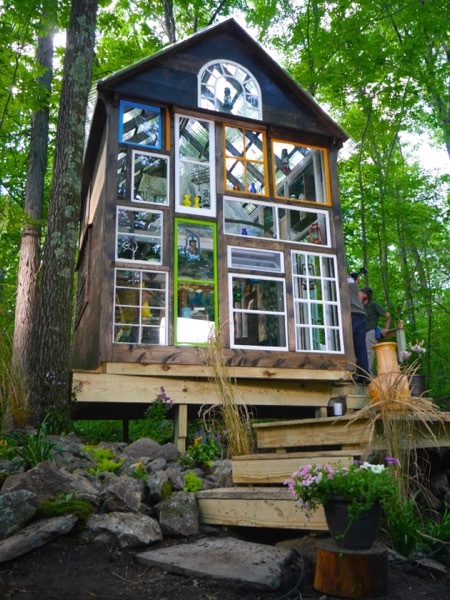 And the way that some of the tiny house builders fit them into the landscape inspires creativity.